Country: Belize | Beer Apprentice - Craft Beer News, Reviews, Interviews and Info. 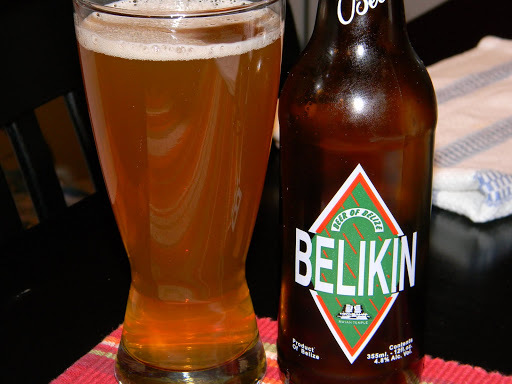 Tonight, I’m reviewing the Belikin Premium Beer from the Belize Brewing Company situated in Belize City, Belize C.A. Honestly, I don’t know a thing about this beer. I haven’t the slightest idea about this brewing company or anything. I barely even know where Belize is located!!!! In Central America somewhere I think. I can say, with complete certainty, that I’m going into this review completely blind. I found a small description from the website, thebeerofbelize.com. Belikin Premium is the crown jewel of the family of beers. Well balanced and rich in body and aroma, and composed of different selected types of barley malt, it reflects the careful treatment in our state-of-the-art modern brewery, combining the latest technology with traditional craft-style brewing. Premium comforts you with 4.8% alcohol content. Only one way to find out for sure……. As the description said. The ABV is 4.8% and it comes in a 12 oz. bottle. The appearance was a somewhat hazy, light honey color with a white crown that was non-existent even with an aggressive pour. What head that was present was soapy and very fizzy. Like a soda-pop or something. Little to no lacing was left behind either. Oh boy, this isn’t starting off well. The aroma had a doughy biscuit tone with only a teasing of wheat. A slight sour note also. It smells damp and musty and not very fresh. I can say that it’s not the most pleasing fragrance that I have ever encountered. The taste was more of the same, but with some subtle differences. I found the doughy biscuit along with some buttery tinges and a minor sour astringency. At least there is a slight malt backbone to make it allowable. I swear I think I tasted a bit of “smoke” or something in there. I don’t know. Maybe my taste buds are broken. The taste was not outstanding, but at least it did have a touch of character I guess. Although, as the beer warmed it became less desirable and more distracting. The mouthfeel was medium to medium/thin. It was somewhat refreshing, smooth, and mostly crisp and it also left a bit of flavor on the palate. So not all bad there. Well….. this is not a beer that I would want to make a night of. I can say that I will probably not pick this up again anytime soon. It wasn’t undrinkable or “rank”, but I just didn’t find it to be very satisfying or enjoyable. It was, however, refreshing enough to be quaffed during the warmer months. It is a bit better than any of the “macros” produced and I could finish it with no problem, which is always a positive thing I guess, but I’d hope that I would be able to find something else on the shelf to be entertained by. I’m sincere when I say that I don’t like to give a bad review or score. I realize that it takes a tremendous amount of time and effort to brew a beer and I feel that I should treat each brewer with respect and give them the benefit of the doubt by granting a “fair” and descriptive account of what I find. I always try to point out some positive attributes about each one I try so as to not alienate anyone who enjoys or brews a particular beer that I give my opinion on. I’m a complete novice at this and only try to do the best I can. Has anyone out there had this? What did you think of it? As always, thanks for reading. I really appreciate it. Also, please feel free to leave a comment.